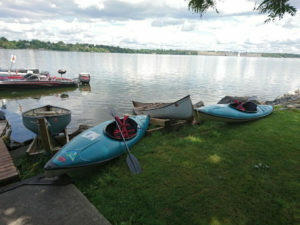 We offer Boat Rentals on Bay of Quinte including a wide range of rentals 16ft Lund fishing boats, pontoon boat, canoes, kayaks and stand up paddleboards. All of our boats rentals come with life jackets and safety equipment. Get your rental boat for some of the best walleye fishing on the bay of Quinte. Trolling motors are also available for daily and weekly rental. We have a small tackle shop with maps of the area and lures that work in the Bay of Quinte for each species of fish. We sell rods, ice & worms on site. Fishing licenses can be purchased at Thorne’s Variety # 613-476-2831 located 2 minutes from us. 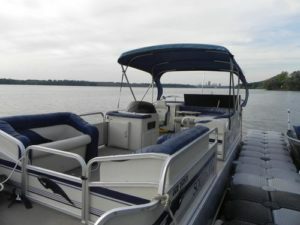 A Boat Operators License is not required to rent our boats. Holds up to 10 people and rents for $350 plus gas for the day (12 hours). 2 hour guided boat tours are also available for $250.